When Neil forces Lana to enter an oration contest sponsored by Lionel Luthor, Clark finds himself caught up in the preparations. This quickly brings him into conflict with Heather Fox, an extremely single-minded (and ironically named) animal rights activist who simply doesn't get the necessities of occasionally killing animals. However, while dealing with Heather's harassment in school is one thing, it's quite another when she discovers an ability to become any animal she touches. Abusing her new powers, Heather stages a one woman terror spree against any she feels have wronged animals. But her attacks are becoming more violent, and she's losing more of herself to the beasts each time. Can Clark bring her down before she kills someone, or becomes nothing more than a mindless, savage beast? Story - 3: The ironic name aside, Heather comes across as both obnoxious and absurdly naive. Surely, she would have to be aware of the necessities of farm life. As it is, her struggles against her rising animal natures is interesting. Her reactions to becoming exactly what she hates... a killer of animals, is palpable. Her lack of integrity, when it surfaces involving a whippet, is a telling sign that she's not as holier than thou as she likes to believe. The subplot with Lana and Whitney preparing for a speech contest is, at best, a non-starter. Whitney's on the fringe of the plot, and it's obvious the action Lana will take long before she takes it. Lionel, while in absentia, looms over the story with a trophy room full of endangered animal heads and pelts. This comes across as incredibly stupid, as that would be presenting evidence of federal crimes for all to see. Clark is presented with a genuine challenge for once... Heather's attacks can injure him because of the Kryptonite in her system, and in nature, she has an almost limitless array of beasts to choose from. His method of dealing with her is clever, and at the same time, gives Lionel a much needed comeuppance. 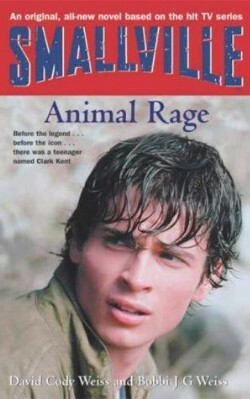 Still, the story is hurt by the knowledge that Smallville eventually did an animal morph episode. Cover Art - 1: Bluntly, they're not even trying. Random promo shots.